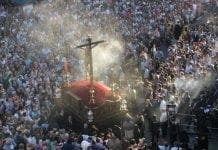 SEMANA Santa marks the week when the Spanish love for procession, pageantry and communal expression reaches its zenith. This incense-scented week of penitence and processions is most keenly observed in the orange-blossomed streets of Sevilla. 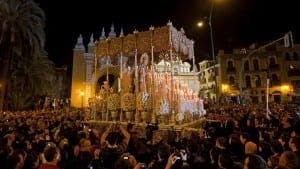 Vast thrones (pasos) supporting ornate religious effigies are paraded through the city. 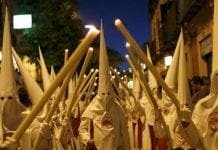 But although ostensibly a religious festival, Holy Week’s long nights and packed streets have much in common with any Spanish fiesta. Families burn the midnight oil to watch the parades, the odd drop of vino is usually on hand to help lubricate proceedings and it’s as much through local pride as religious piety that Sevillanos call out ‘Guapa!’ when the Virgin’s statue passes. Nevertheless, for the first-time observer, the hooded ranks of Nazarenos – the week’s defining image – can be a little startling. 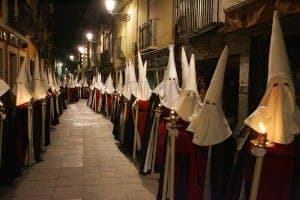 Their beautiful medieval robes are co-ordinated in the colour of each religious brotherhood, or cofradia, but their conical hoods, with slits for eyes, have an almost menacing solemnity. Sol y sombre, Spain’s two defining extremities, are both here during Semana Santa before the city finally explodes into a riot of colour for La Feria. The cofradias organise the processions and the task of carrying the thrones is highly sought after, with the costaleros – or ‘sack men’ – carrying out this role. Until the 1970s, sturdy dock workers were hired to perform the sinew-straining job. 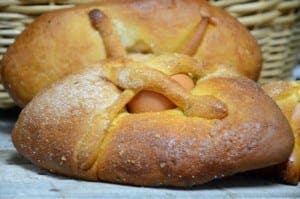 Down in Gibraltar, British and Spanish traditions are fused as Easter revellers gobble up bollos de hornazo – a sweet bread made with eggs, sugar and aniseed – as well as hot-cross buns and Cadbury’s Cream Eggs. The presence of Roman centurions at the parades adds to the theatre and underlines that this is an occasion for everyone (in Spain, even the dastardly Romans who were responsible for it all are invited to commemorate Christ’s crucifixion). 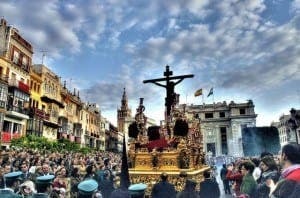 The sheer scale and length of the occasion can be a little overwhelming, but if you are lucky enough to be in Andalucia during Semana Santa you will be right at the heart of one of Spain’s most extraordinary events. 50: The number of costaleros it can take to carry the floats bearing images of Christ and the Virgin Mary. 70: Cofradias involved during Sevilla’s Semana Santa.